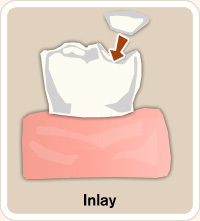 Inlays / Onlays / Overlays are all basically the same - the prefix of the word describes its position on the tooth "in", "on" or "over"
Dental inlays / onlays / overlays replace a part of the tooth, which has been lost, without unduly having to cut away other unaffected parts of the tooth. Traditional metal fillings make use of an undercut that that helps keeping the filling in the tooth to aid in retention. In doing so, the tooth's structure is unnecessary lost and cracks normally appear after a few years. These teeth also take on a "blue-ish" appearance that is aesthetically unpleasing. Porcelain is typically used to replace amalgam fillings and to restore the badly reduced tooth structure which were caused by trauma or tooth decay. 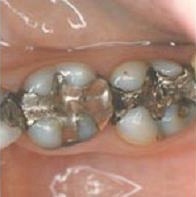 The strength and longevity of a well constructed and /or well maintained inlay / onlay, are better than an amalgam filing. The great natural appearance makes this restoration almost undetectable with the naked eye! 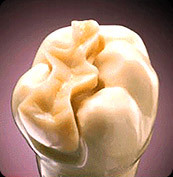 Porcelain is also stain-free and the first choice in the cosmetic replacement of big restorations. The cost of a porcelain inlay / onlay / overlay is more costly than other alternatives, but this is the truly long term solution. The newly bonded porcelain restoration will prevent any further treatment for years to come, making this procedure truly a long-term investment that also looks 100% natural! 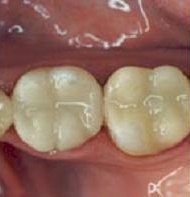 Also see COMPUTERISED FILLINGS the most advanced Dental Technology available today!